Support e-NABLE Canada in NEPAL as we get ready to go to Nepal to help setup a 3D printing lab in Kathmandu for the purpose of developing and producing 3D printed hands and arms to be donated to recipients all over Nepal. Join us and help make a difference, please give today. Just $40 will provide the materials for one device. Be the first donor to support Alliance for Project Based Learning Solutions/e-NABLE Alliance! After being approached about the work that the e-Nable community is doing, e-Nable Canada was asked if we could help the people of Nepal. Through research and connecting with medical professionals and a non-profit in Nepal, we confirmed that a substantial need exists. e-Nable Canada, in partnership with e-Nable Nepal and our various advisors, have decided the most efficient use of resources is to help facilitate the creation of a permanent 3D printing lab dedicated to the building of e-Nable devices to be provided to the population of Nepal at no cost. Peter Byron and Rishi Shrestha from e-Nable Canada will spend 4 weeks in Nepal this summer working with e-Nable Nepal to equip the lab, share our experience and knowledge with personnel there about 3D printing, 3D printing material options, printer maintenance, device customization with CAD software etc. All money raised for this project will help provide equipment, training and materials required to construct the first 150 e-Nable devices to be delivered to the people of Nepal by e-Nable Nepal out of their newly organized 3D p rint lab. It's important to understand that the relationship between the e-Nable organization and a child recipient must be an ongoing one. There must be an ongoing consultation to ensure safe usage of these devices and there needs to be updated devices every so often as children outgrow them. This project is about creating a sustainable service center to serve the community in Nepal. The money we are raising will allow us to set a strong foundation for e-Nable Nepal to create that service center and hit the ground running. Bring inexpensive, highly customizable, e-Nable 3D printed hand and arm devices to children in Nepal. The World Health Organization estimates that "93 million children live with a moderate or severe disability. The majority of this population would benefit from prosthetics and orthotics services." "Only 5–15% (approximately 1 in 10 persons) of the population in need has access to prosthetic and orthotic devices. The problem of accessing such devices is more acute in low- and middle-income countries." Nepal is emerging from many years of agitation, political upheaval and change from a feudal monarchy to a republic. It is estimated, that 7% to 10% of the 28 million people of Nepal have disabilities. Causes of disability include natural disasters, polio, war injuries, leprosy, accidents, birth anomalies, surgical and medical errors, mental health issues etc. Although Leprosy has been largely eliminated, Nepal is one of a very few countries UNICEF identifies as being endemic for this disease. Used with the safety guidelines in mind, e-Nable 3D printed devices can offer a solution, reducing many of the issues mentioned previously. Our partners in Nepal have estimated that they will deliver 150 devices about as quickly as they can produce these customized devices. It is expected this estimate will rise very quickly as the project begins operations in Nepal and the word gets out. There are numerous people and organizations involved in making this project a reality. The e-Nable community offers the background, infrastructure and designs to make this project possible. The community is also very important as mentors, advisers and more. Today, e-Nable is in 48 countries. There are over 8000 volunteers around the globe. e-Nable Canada is one of 5 e-Nable chapters that can be found in Canada. They are located in NL, NS, QC, ON and BC. Where possible the budget will be spent locally in Nepal. 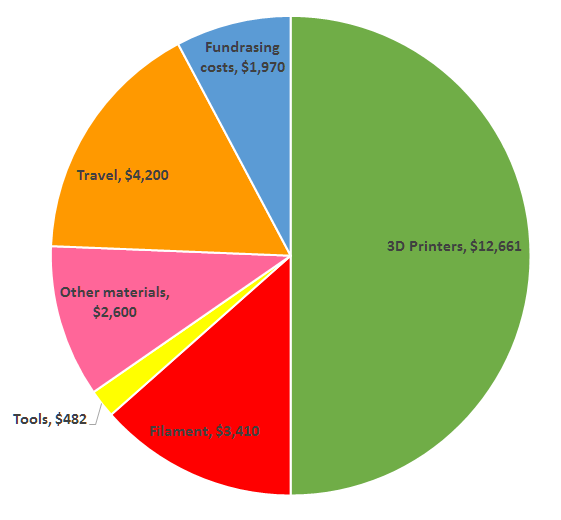 We are continuing to explore the selection of less expensive 3d printers. We are exploring the addition of emergency power supplies to avoid print failures during power fluctuations. We are also exploring the addition of 3D scanning technology to allow for scanning limbs of recipients to allow for better fit management and customization. 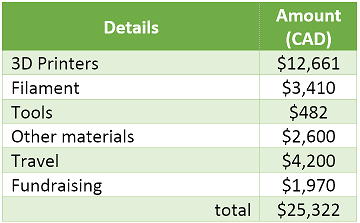 The table below shows what your gift will help provide for the children of Nepal. Spearheading the fundraising here in North America is Peter Byron and Rishi Shrestha. We teach in a Computer Aided Design program in Montreal at Rosemount Technology Centre. Rishi has a degree in mechanical engineering, 20 years of experience in design and four years of experience in teaching. Rishi has been a volunteer working with the Association of Nepalese in Quebec for nine years, 3 of those years as the secretary. He has also recently begun volunteering with e-Nable Canada and working with 3D printers. Peter has 14 years of experience in teaching, 10 years of experience in design, and five years of experience in project management. He has been volunteering at a local makerspace for two years, founded e-Nable Canada, the first chapter of e-Nable in Canada two years ago and has been working with 3D printers for almost five years. In support of this project we have spent time and money learning new skills, 3D printing various models of e-Nable devices and experimenting with different materials. We have also chosen to absorb the cost of purchasing a Prusa 3D printer which, after testing, we have decided to bring to Nepal as it is easy to get there, less expensive than other printers of similar quality and is proving to provide high quality prints. By making this purchase we have been able to work with this model daily to know it well before going to Nepal. Just a $40 gift will provide the materials for someone in Nepal to receive a 3D printed e-Nable device.